Most of the lodgings, restaurants and attractions included in Easy Access Chicago are located in the following neighborhoods. These, however, make up only a few of the diverse cultural and ethnic areas that make Chicago the great and exciting city it is. To learn more about other neighborhoods, visit www.chicagogreeter.com. The elevated trains encircling the heart of downtown Chicago give the Loop both its name and unique look and feel. Located here are the city's central business, political and cultural institutions, along with many of its architectural gems. Chicago's newest attraction, Millennium Park, the Art Institute of Chicago, Chicago Cultural Center, Architectural Center Foundation and Chicago Symphony are all on Michigan Avenue. The Loop is also home to Chicago's theatre district and the venerable Marshall Field's department store, now Macy's. The South Loop is a diverse area stretching from the Harold Washington Library on Congress Parkway to McCormick Place, Chicago's largest convention center. It includes the picturesque Museum Campus, where the Field Museum, Shedd Aquarium and Adler Planetarium are located, and Soldier Field just to its south. Chinatown, just west of McCormick Place, is also part of the South Loop. Home to the University of Chicago, this charming residential neighborhood is located along the lake on Chicago's Southside. Hyde Park is unsurpassed in the diversity of its museums, from the Oriental and Smart Museums at the university, to DuSable Museum of African-American History in Washington Park, to the Museum of Science and Industry at the lakefront. Frank Lloyd Wright's Robie House in Kenwood is also a must-see. A visit to Chicago is not complete without at least one meal in the lively, delicious restaurants of Greektown, centered at Halsted and Adams. Further north at Halsted and Randolph is another prime area for dining and nightlife. The United Center, Union Station, Ogilvie Metra Transportation Center and the Greyhound Terminal are also located here. 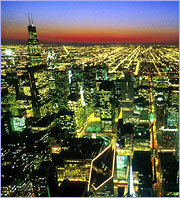 This trendy neighborhood lies to the north of the Chicago River and west of the Magnificent Mile area. Among its popular tourist attractions are the Hard Rock Café and Rainforest Café. River North is also home to the Merchandise Mart, a large concentration of art galleries and some of city's best restaurants. Also known as "Magnificent Mile," the section of North Michigan Ave. from the Chicago River north to Oak Street is Chicago's answer to Beverly Hill's Rodeo Drive and New York's Fifth Avenue. Here are clustered not only exclusive retail establishments, but also first-class restaurants and hotels. Attractions include the John Hancock Center and the Museum of Contemporary Art. Virtually a neighborhood in itself, this unique and accessible attraction offers almost everything except overnight accommodations. With restaurants, snack bars, museums, theatres, shopping, outdoor recreational facilities, piers for sightseeing and dining vessels and even a Ferris wheel, Navy Pier is a great place to spend the day, no matter what the weather. This section of Chicago is comprised of the Gold Coast and Old Town, which lie between the Magnificent Mile to the South and Lincoln Park to the North. The affluent Gold Coast neighborhood boasts mansions, tree-lined streets, upscale shopping on Oak Street and trendy restaurants on Rush. Old Town has some of the city's most trendy dining and entertainment venues including the Second City, located mainly along Wells St. Other neighborhood attractions: Steppenwolf Theatre, Chicago Historical Museum and the Pump Room at the Ambassador Hotel. Youthful and upscale, the lakefront neighborhoods of Lincoln Park and Lakeview offer a mix of busy commercial blocks and quiet residential streets. Clark, Halsted, Lincoln and Broadway are prime areas for shopping and dining. Located in the expansive city park for which the area is named are the Lincoln Park Zoo and Conservatory and the Notebaert Nature Museum. Just north of Lakeview is Wrigley Stadium, home to the Chicago Cubs.